Hey Boos! Happy June! Would you believe we’re supposed to be in Summer with this horrendous weather that we’ve got going on at the moment? I guess it wouldn’t be a bank holiday without the rain! Still,Asos knows how to put a smile on my face because this Monday they finally listened to my whingeing and offered EVERYONE 20% off of everything. No discrimination between students and full time workers was had and let me just say what a time to be alive. I hadn’t shopped on Asos for almost a year, mostly due to my need to “adult” aka save some money for a rainy day so I did feel ever so slightly guilty about splurging. Still, I’d been good for so long this offer was too good to pass up on. I spent most of bank holiday Monday browsing the endless pages for something that called out to me. In the end I had 6 things in my basket, all a little bit garish and slightly different from my usual style. As it got closer to midnight and I lay in bed, I grabbed my phone and impulse bought a few bits and pieces. After trying it all on, most of it didn’t fit how I imagined it to so it’s already been repackaged to be returned but what I did keep were my two new favourite additions to my wardrobe! 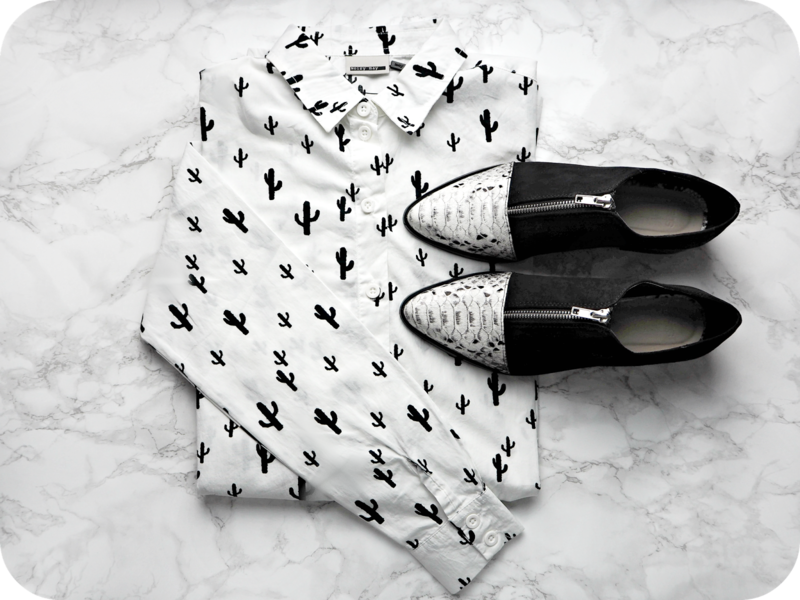 The first is this Cacti print shirt by Noisy May. You might have noticed that I am completely obsessed with cacti at the moment, so when I saw this shirt I had to snap it up. I clearly didn’t read that it said “oversized” on the website so when I opened it up and tried it on and I was surprised that it’s a lot larger and boxier than I had imagined. This isn’t a problem for me at all because oversized is definitely my go to style and I couldn’t wait to style it. I did think that the cotton of the shirt was a little stiff but after a good wash it should be a little softer. I guess for the shirt to keep it’s boxy shape it needs to be a little bit stiff. All in all, it’s a definitely keeper. The second purchase that I cannot wait to share with you are these Asos Mayor pointed flats that called out to me as soon as I saw them. They are serious beauties that look even more amazing on. Usually I’m unable to buy shoes online due to have ridiculously wide feet and god awful bunions but when I saw them I literally couldn’t get them out of my head so I just had to take a chance on them. Boy am I glad I did because when they arrived the next day I can tell you that they fit like a dream!!! All of the heart eyed emojis! 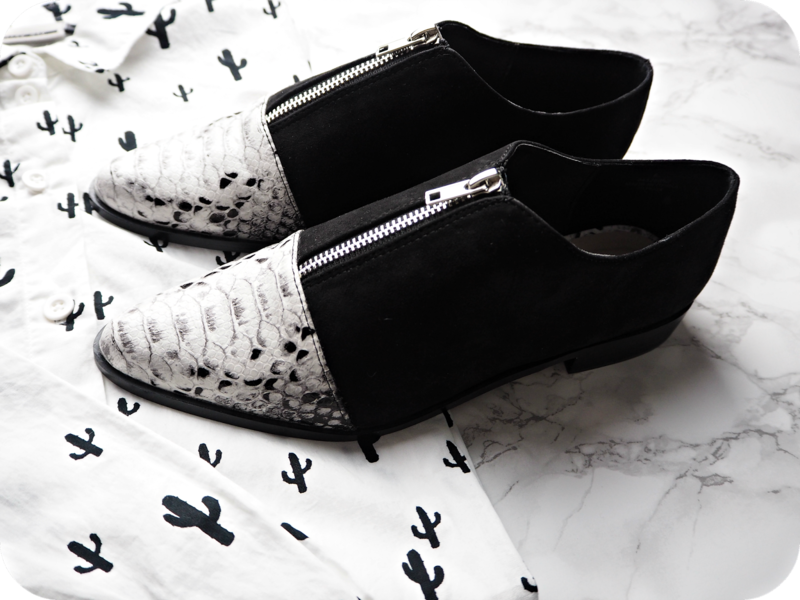 I cannot wait to wear and feature them both in future OOTD pics so watch this space.